Visiting the Prado Museum in Madrid has never been more fun and educational for kids and families! This private 1.5 tour has been designed to make children and parents love the Prado and its famous masterpieces. You will visit the highlights of the collections including Van der Weyden's Escorial Deposition, Bosch's Garden of Earthly Delights, Velazquez's Las Meninas, Goya's Third of May and other famous masterpieces. You will have an exclusive guide specialized in working with kids that will engage the whole family with games, scavenger hunts, visual tools and other playful activities. Usually children do not like museums but after this tour they will ask you to stay in and continie the visit. You will love it! Enjoy 1.5 hour interactive guided Prado tour for kids with skip-the-line tickets. The world-renowned Museo del Prado has some of the greatest masterpieces of Western art that were in the main commissioned and procured by the Spanish royal family. In the company of a family-oriented guide we introduce the children to this marvellous collection, engaging them in the art on a very personal level. There are numerous families depicted in the collections, from the Holy Family to Las Meninas, and this tour gives an insight into their lives, discovering interesting stories about the people. 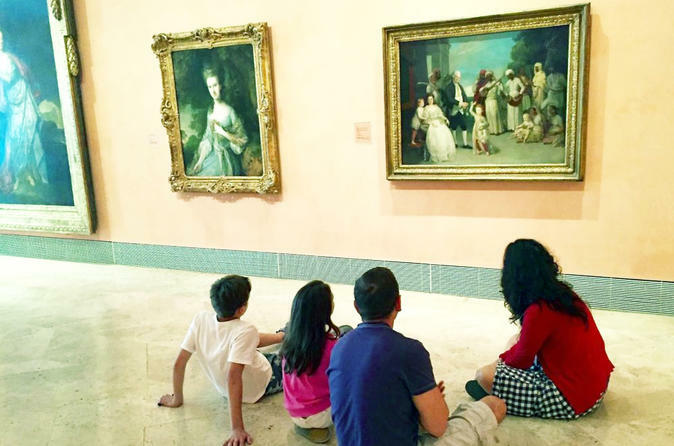 The children will also learn about the evolution of art through the centuries – a perfect educational activity for the kids whilst in the beautiful city of Madrid. This tour of the Prado Museum is interactive and designed to encourage children’s natural curiosity and to stimulate their visual memory. They will take a journey from the Renaissance through to the nineteenth century learning about artistic techniques and mythological themes. They will discover monsters and heroes and explore different themes; family units, patronage, the history of taste and fashion, how girls and women were represented in art and the very important role that animals played in a series of paintings. This tour is child-focused, designed for those between the ages of 6 and 14 in particular. However, there are new perspectives for adults to ponder as we decipher masterpieces and little-known work of art, side by side. We cater for the inquisitive minds of children and the enquiring minds of adults alike on this unique tour that has been designed by ourselves using exclusive learning materials featuring clues that help you to unravel the mysteries of this fantastic collection. Our guide has the ability to make the art truly come alive and will help connect the works to the visitor’s experiences at home and during the tour. The children’s minds will be opened up to world of art via stimulating activities and engaging questions. We hope that by the end of this tour each little “menina” or prince will take away an appreciation of art and a desire to discover more. All our kids’ tours can be customised to your individual family’s requirements. Please contact us for more details.